Spring is here Spinach Salad!! 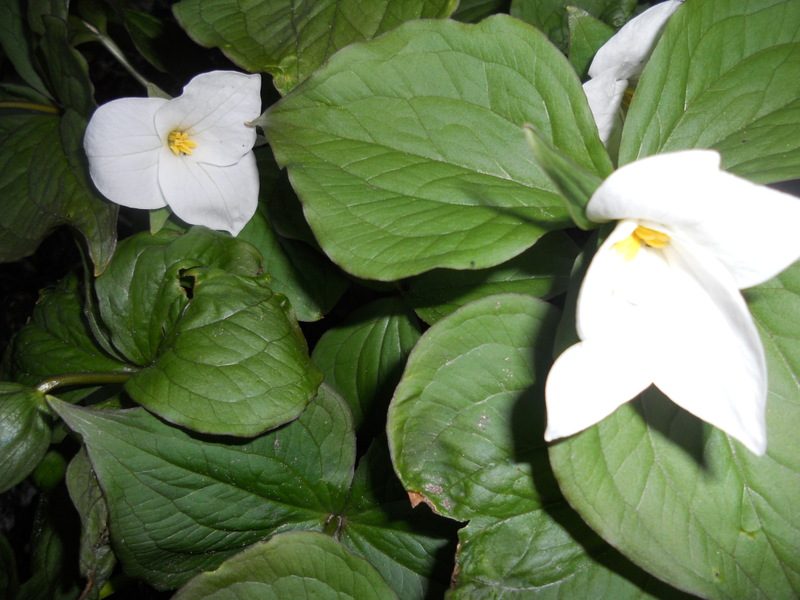 Finally, a really beautiful Spring day and when I got home tonight I glanced in the back of the yard and saw that the trillium is just beginning to bloom. Yeah! This is post number 100 for 2 peas in a blog! Time flies. I was going to post a yummy 100 calorie smoothie for the 100th post. So last night I made a couple different types and the 100 calorie version wasn’t very yummy, so I’m going to work on that. I wanted to avoid using artificial sweetener but I may have to resort to that. So instead, I’m making an old favorite that I’ve made a bit healthier. My sister Sharon makes the most amazing spinach salad that we insist she bring to almost every holiday. We don’t feel guilty indulging ourselves with her version on holidays but this version won’t make you feel too guilty if you want to enjoy spinach salad between holidays. 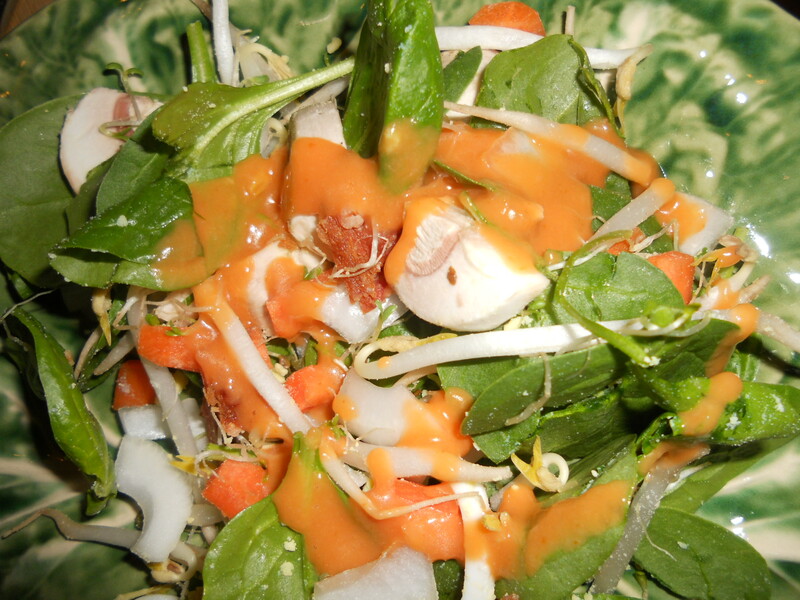 The amounts of onion in the salad and in the salad dressing can be increased if you have a nice sweet onion. I just bought a big bag of Vidalia onions yesterday, so I almost doubled the amount of onion in the dressing. If it isn’t the season for sweet onions, then a red onion looks pretty in the salad. Puree all ingredients for the dressing in blender or with hand held blender until smooth. I like to use pre cooked bacon and cook it in the microwave for 30 to 40 seconds wrapped in a paper towel to make it a bit crispier. Mix all ingredients in a large bowl, toss with dressing and enjoy. 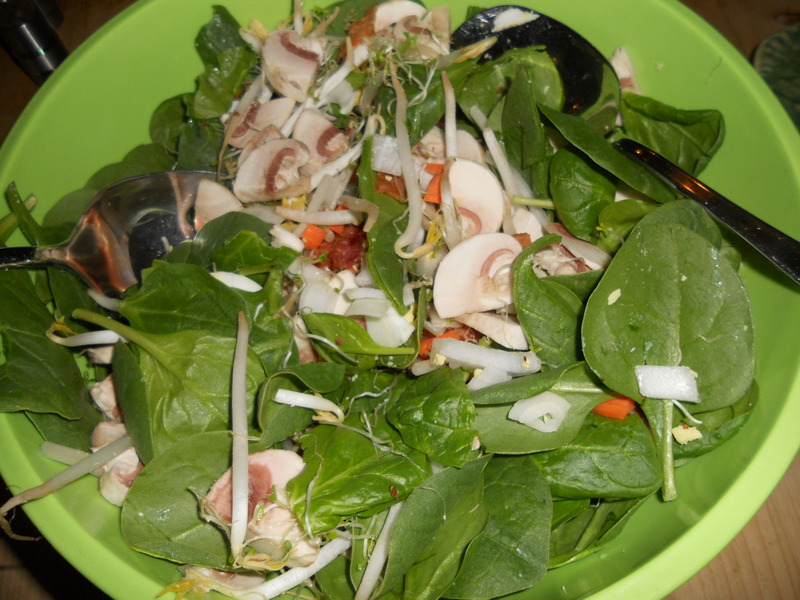 2 Responses to Spring is here Spinach Salad!! what did you change that made it healthier? This version has less oil in the dressing and the oil that is used is olive oil rather than bacon fat! !